We've already looked at how to geoCode addresses using various APIs. 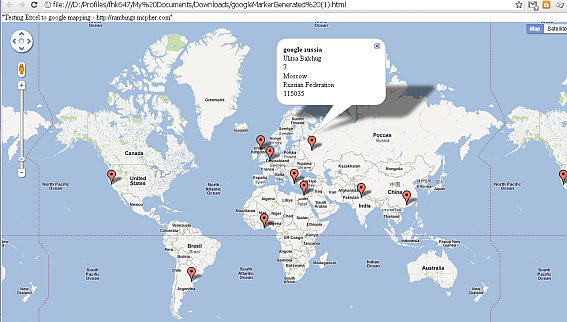 Now lets look at using Google Maps to put markers on a Map using an Excel worksheet as input. As usual you can find the completed example in the googleMapping.xlsm download. Before running this please check the parameter worksheet and change the filename value for the place that the application will generate a web page to something relevant for your machine. Look for the filename in the Marker html section of the Parameter Worksheet. The objective of this section is to plot this sheet on a map, with a marker for each row. In addition we are also going to have a popup box that will show the customer name and the full address. The final map using our test data looks like this. Like many of the examples on this site, we are using parameters to drive the behavior of the code. Many of the parameters used in the geoCoding examples are used, but we have a couple of new sections in the parameter worksheet. 4 pieces of data are needed for placing markers on the map are given under the 'Markers' parameter block. This instructs the application which columns in the table contain these values. The title Marker Parameter specifies the column containing the value you want shown in reaction to a mouse hover over the map marker. In this case, we want to show the customer name. The content marker parameter specifies the column containing the value you want to show in the pop-up box in reaction to a click on the map marker. In this case, we want to create a description of the customer and his address, and we can use html to construct it if necessary. You cab see that I've added a content field in our example application that looks like the below, but you can of course put whatever you want in there. A blank content field will mean that you don't need a pop up box for that marker. ="<b>" & B2 & "</b><br>" & SUBSTITUTE(L2,",","<br>") & "<br>"
The application creates , and displays, a web page in the place you specify in the filename parameter of the Marker Html section of the Parameter WorkSheet. As long as you retain the <body onload="initialize()"> (load up the map when the page loads) and <div id="map_canvas"></div> (the place on the web page to contain the map), you can tailor this body parameter as as much as you like. Most of the code used here is already covered in Creating Google Maps Layers from Excel Data, json, Data Manipulation Classes, and Google Visualization but here is the specific code for creating the html file from the Customer Worksheet. tag = "<" & tagName & ">" & vbLf & item & vbLf & "</" & tagName & ">"